IEC College of Engineering and Technology, Greater Noida is approved by AICTE and affiliated to Dr. A.P.J.Abdul Kalam technical university, Lucknow. tel Management, Pharma, Vocational education, and an organization of national repute. IEC has also been awarded various core ICT projects by Government of Madhya Pradesh, Rajasthan Government, and Delhi Government. Managers would emerge empowered to face the challenges. Create an ambience for Quality education. The course is the basic for IT jobs. Students not interested on medical or any other related fields prefer this discipline so that they get involved in that and be successful. Before applying for B.Tech candidates must be aware of the admission criteria and the cut-offs. To get better opportunities and high positions you need to master yourself with few of the basic foundations and B.Tech students dreaming for this could apply for M.Tech to make their dream come true. It is a 2 years course most of the time with workshops, internships and project work that prepares students to lean from scratch by themselves. Candidates interested in pharmacy opt for B.pharm and to proceed further choose M.Pharm. Having a master degree you can apply for any pharmacy related jobs. You can even research under this course in a particular specialisation to get successful in your career path. Team building is one of the main qualities for successful career growth. And pursuing MBA helps you learn each and every quality of being an entrepreneur, leader or business man to lead a company. Maths must be their main subject to apply for MCA course. It is duration of 3 years and you will get to learn about computers and their application in depth. If BCA is a bachelor’s degree would be helpful as you will have a strong foundation to process. There are different specialisations related to mathematics and computers. Accommodation is one of the major concern and you look for when joining for colleges. They have a friendly, secured environment that makes you feel like home. You have recreation centre, power back facility, a separate health club and sport activity centre. You have an enjoyable and easy hostel staff they support you in any emergency round the clock. Also you will have an academic staff to meet and clarify your doubts. The fee varies because there is an option of attached and non-attached rooms could be choose on your choice. Placement department takes care of each and every interpersonal skills and technical skills of the students. They arrange training programs, seminars, workshops and conferences to develop their communication skills, time management, public speaking that could be helpful for their career. Can I get admission in cse or information technology branch in iec with 40 marks in jee main a? Can I get cse or information technology branch in iec with 40 marks in jee main and 75-80 % in 12th. I belong to Rajasthan? Ice college fees structure for btec? Help me with the fee for B.Tech for the 1st year in IEC College of Engineering and Technology, Greater Noida? Please find the fees structure for engineering course with intake. Good score in JEE Main and Mini. 50% or in 10+2. What is the fee for B.TECH in IEC College of Engineering and Technology, Greater Noida? IEC College of Engineering and Technology fee structure for B.Tech is approximately INR 383000/- for complete 4 years course. Candidate should attain minimum 50% in graduation and a valid score in entrance examination to get IEC College admission. Shortlisted candidates for IEC College admission will be called by the institute for personal interview based on marks obtained in graduation and entrance exam. IEC College admission will be done on the basis of academic credentials, entrance exam and also performance in personal interview. Knowledge about placement and facilities of college? 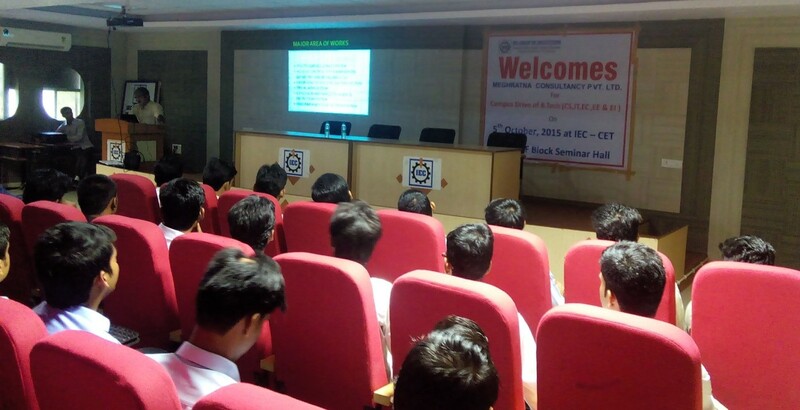 Facilities: IEC Noida has a beautiful infrastructure and Facilities which includes Library, Hostel, Sports, Medical. Placement in 2016 ,2015 overall? Write Your Reviews on "IEC College of Engineering and Technology, Greater Noida"
Are you Interested inIEC College of Engineering and Technology, Greater Noida"? Please provide the following details. Ask Question on "IEC College of Engineering and Technology, Greater Noida"?